You may have deduced that I’m a collector….From esoteric cars, to vintage sport watches—more on that soon, to Buddy Lee Dolls. But, without being a nut, I tend to make my clothing, suits/ties/shoes last a really long time. As a UCLA student in the 80’s, I was lucky enough to work at what was SoCal’s epicenter of preppy/trad, At Ease. With outposts in Westwood, Newport Beach, Pasadena and Tokyo, At Ease carried the best in American made Trad clothing—Norman Hilton, Southwick, Gittman shirts and Alden shoes. While this was 25 years ago, I still own and wear a surprising number of pieces that I acquired there as an employee—shoes in particular. Good care of my beloved Alden shell cordovan shoes is key, and as I’ve written before, I’m lucky to have discovered great shoe shines—the current favorite is Pasquale’s in Los Angeles and the amazing Saleem at Junior’s deli in West Los Angeles. The other trick is that I’ve always been a dedicated user of shoe trees. My At Ease boss, and dear friend, Joe Vasco, who still sells Trad at Gary’s and Company in Newport Beach, always insisted that our venerable customers pick up cedar trees with their Aldens, and as dutiful employees we did the same…The investment paid off. While shoe bags, and trees may seem a little over the top, they’re pretty great. Bags seem even nuttier, but bagging your shoes after wearing, avoids scuffs and makes shines last. I always grab the muslim slipper bags from The Mercer Hotel, and after many years there, I have a great set to go along with the bags that come with most of the shoes I now buy. Trees come in several flavors. Bespoke shoe guys, I’m talking full custom, get a lasted shoe tree, that is an actual representation of the foot, which is the basis for the shoe, which is made off of a last, that is based on your foot–Clearly the ultimate luxury. High end Northampton (English made) shoemakers, Edward Green and John Lobb, make lasted trees, based on their time tested lasts—606, 202, 888 are Ed Green examples. Each a slightly different shape that have specific fans for each. The Lobb Prestige line shoes actually come with lasted trees and bags. 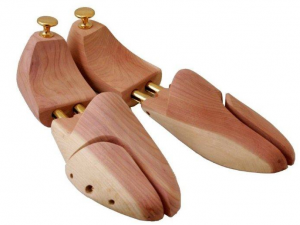 France’s contribution to men’s classic footwear, J.M Weston, also sell trees, made of beautiful polished lemon wood. But, for the most part, I’ve invested in non-lasted cedar shoe trees that provide not only the best value, but actually work the best. The purpose of a good shoe tree is not only to keep a shoes shape, but to wick away moisture from a shoe inside out. As lovely as the polished lemon wood trees are, they just don’t do the job that the best off the rack trees from the US based Cedarviile Store, or the UK based Cathcart Elliot offer. My choice are the Epic Twin Tube cedar trees, currently on sale at Cedarville for $24.99. This may seem like a lot of bother, but my vintage Alden loafers—At Ease 1983, are old friends, but even with many years of sockless wear, still have plenty of miles to go. I’m happy to say that my Ferragamo lace ups from 1985 are still in tact and make an appearance from time to time thanks to shoe bags and good cedar shoe trees.